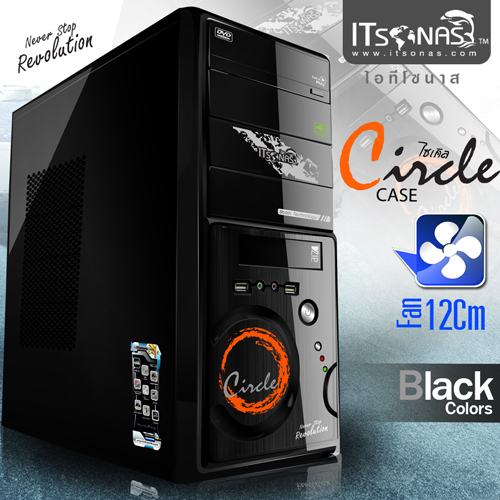 • Model: CIRCLE CASE • ATX CASE Size and Power Supply 500 Watt (24pin) SATA 2 IDE 3 head & head. Power Supply500 Watts.8cm. Fans Side 1 Fan 12cm. Length of 425 mm., Width 180 mm. Elevation 410 mm. IDE Port3 Ports SATA Port2 SlotsSlot HDD3 Slots Slot CD / DVD ROM2 Slots Slot FDD / Card readerWith Audio & Mic compatible card reader. der (Reader Card) USB 2.02 PortsMaterialMaterial Secc durability Warranty1Y.